Maryland State Records are grouped by age class on this website. On each age class page, the records are broken out by weight class as well as whether the lift was performed Unequipped or Equipped. For record keeping purposes the term Raw is used for unequipped. Starting January 1, 2015, meets and state records have new weight classes. 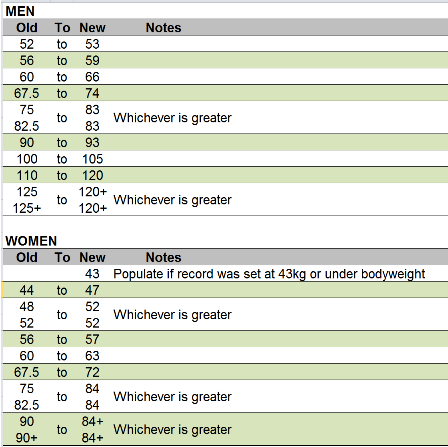 In accordance with USA Powerlifting guidelines, existing state records under the old weight classes were converted as of December 31, 2014 to the new weight classes based solely on weight class (not a lifter’s body weight). Records under the old weight classes have been archived and are located directly under the new weight classes on the same age class page. USA Powerlifting members that are residents of Maryland or Washington, DC are eligible to set and break Maryland state records according to the rules of competition. If you have any questions or would like to report a new record (from a meet on or after 1/1/2015), please contact the State Chair.